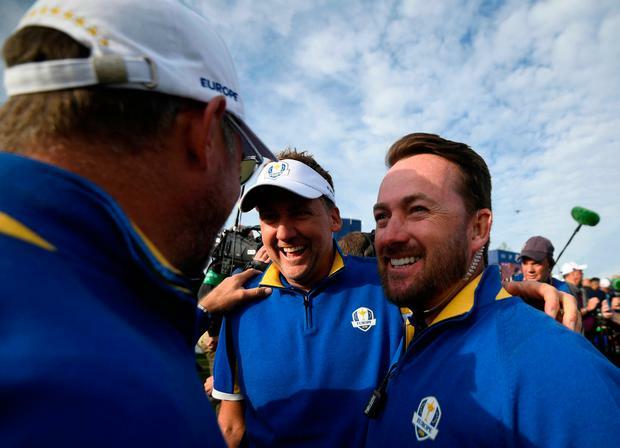 Graeme McDowell admits that Europe's thrilling victory has reignited his desire to make the team in 2020 and put his captaincy ambitions on hold. After playing in four Ryder Cups, claiming the match-clinching point at Celtic Manor in 2010, he's missed the last two editions and recognises that having the respect of Europe's new breed of young guns at Le Golf National has made him feel good about himself again and rekindled his desire to play again. "Obviously, I am not a whole lot older than some of these guys in the team room but you can have an impact on the likes of an Alex Noren or a Tyrrell Hatton and see that they do respect you as a player and what you have achieved," McDowell said. "So it's nice to be able to have an impact on these guys and tell them stuff they don't know. Having played four, it's nice to feel they respect you." McDowell will be 40 next year and knows that as he may have to wait until 2026 at least before he can be considered a potential captain, making the team again as a player is an ambition worth cherishing. He might be the perfect age to captain in 2026, when Adare Manor would be the likely venue. But he's keener than ever now to play again, especially after watching players like Henrik Stenson, Paul Casey and Ian Poulter excel in their 40s in Paris. "It was great to be part of the backroom start this week," the two-time French Open champion and 2010 US Open champion said. "But it was a little bittersweet. I'd love to have been part of the team and playing with the boys on a golf course I love so much." He felt Thomas Bjorn's attention to detail was a key factor in Europe's 17.5 to 10.5 win, especially his use of experienced players. The Dane had former match-winning Ryder Cup heroes make short videos for the players in the last four singles berths - ninth man Paul McGinley from 2002, 10th man Colin Montgomerie from 1997, 11th man Martin Kaymer from 2012 and McDowell, who was the anchorman at Celtic Manor in 2010. "I did a video for No 12 just to explain to them what goes on," McDowell said. "It was really cool. It just gave these guys the reference point to understand what it means to be there and then all of a sudden, if your match becomes pivotal, that you can achieve and you can be the guy."